We are so ready to welcome spring with open arms after months of chilly weather! Today, Maxine is going to show you how to capture the beautiful season on a bright and colourful scrapbook layout using the Blooming Lovely collection. This scrapbook is perfect for journaling your picnics in the sun, your afternoons in the garden and all the fun you will have with your loved ones amidst the flowers and buzzing bees! 1. 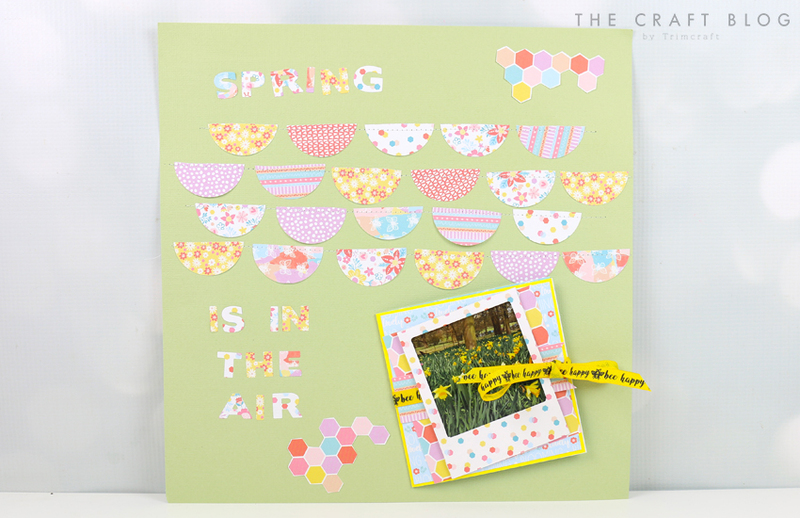 Cut out a selection of circles approximately 4.5cm from your chosen Dovecraft 6x6 Blooming Lovely paper designs. Cut all your circles in half. 2. Line up your half circles across your chosen First Edition Textured Card Stock sheet, in four rows, horizontally. To keep them secure as you stitch them on, add Washi Tape along the bottom. This can be removed once you’ve finished stitching. You can stitch your half circles on with a sewing machine or by hand. 3. Pull the threads through to the back of the scrapbook page and secure the ends. This gives a neat finish on the front of the page. 4. Die cut the words ‘spring is in the air’ with the First Edition Alphabet Dies and adhere to the page as shown. 5. Cover your Dovecraft chipboard frame with your chosen Blooming Lovely paper design and cut out the aperture with a craft knife. Use Dovecraft Perma Fix tape to adhere the photo to the back of the frame. 6. Take a complementing Blooming Lovely 6x6 piece of paper, fold in half, both horizontally and vertically. Turn over your sheet and fold diagonally both ways. The sides should now pop into place as you fold it. 7. Cut your coloured Dovecraft 6x6 card blank down to a 11.5cm square. Adhere pieces of coordinating Blooming Lovely paper to the inside and outside of the card blank. 8. Take the folded backing paper you made on step 6, turn it round to look like a diamond shape and adhere to inside of the card blank. Ensure to only adhere to left and right corners to enable it to pop open. This is the perfect place to add your journaling. 9. Layer a 10cm piece of Blooming Lovely paper at an angle, to the front of your 11.5cm card blank. Add a 11cm x 3cm strip of complementing Blooming Lovely paper with a v cut on the end across the centre of the card. 10. Take a length of Dovecraft ribbon, adhere to the back and front of the card blank with Dovecraft Perma Fix, ensuring that the ends are long enough to be tied at the side. 11. Stick the photo to the front of your card blank, at an angle and secure the card to the bottom right hand corner of your layout. 12. Cut out some pieces of the honeycomb paper and adhere to the page to finish. The Blooming Lovely collection will be sure add the springtime flourish you're looking for to any sunny scrapbook layout! The stitched element really adds a personal and homey feel to this project. What will you scrapbook this spring? We would love to see so don’t forget to share them in the inspiration area and to #trimcraft when uploading to social media.